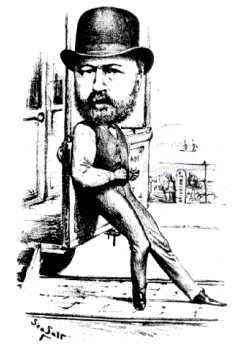 Magnus Volk was a great inventor who was born in Western Road, Brighton in 1851. He was involved in inventing all sorts of peculiar items and activities. He was one of the first people in Brighton to light his house with electricity, for example. Volk worked on the clocktower in 1887. He provided an hydraulically operated ball for the top of the clocktower that rose up a mast on the hour, every hour. When it got to the top it would drop to the bottom with a great clang. Unfortunately, it proved very unpopular with local residents, because of the noise. What Magnus Volk is remembered for nowadays, of course, is the electric railway that he invented which still runs along the seafront today. This was inaugurated in November, 1883. Initially, it only ran a few hundred yards along the seafront, but it was soon extended and eventually reached as far as Banjo Groyne. It was the world’s first publicly operated electic railway when it opened, and was quite a revolutionary idea. The railway you see today, of course, is rather different to what you would have seen back in the 1880s. In those days, parts of the track actually ran on stilts on the beach, ten to twenty feet up, so the journey must have been rather more thrilling. Into the 1930s you were still actually travelling over the waves at various points. In 1896, Magnus proposed extending his Volks Electric Railway to Rottingdean. The railway actually took passengers further out to sea, some 50-100 yards offshore, operating on stilts. It was nicknamed the Daddy-Longlegs at a fairly early stage, because of its rather ridiculous appearance. I am also interested to hear from any Magnus Volk relations as he is my great grandfather on my father’s side. I know no one from this side of my family as my grandfather disappeared when my father was only a toddler. His name was Edgar and I believe he had other children with other women. I would be interested to hear from any of Magnus Volk’s relations as he is my great grandfather on my mother’s side. You can e-mail me at susancampbell_34@hotmail.com. The address of Magnus’s son Conrad, was 5 Edenhurst, Oakhill Road, Sevenoaks, Kent. With reference to my previous notice, if anyone wishes to contact me my new email address is maryannevolk@yahoo.co.uk. I am particularly keen to hear from Stephen Volk. Hi, Mary. I have emailed you but haven’t heard back from you. I’m intrigued as hell as to why you wish to contact me in particular…? Also – Hello Joe! My grandmother was Clara Voke Stanford. Her father was Thomas Voke Stanford who was married to Matilda Jane and they lived in Norwood in 1857 at the time of Clara’s birth. I always understood she was related to Magnus Volk. Can any one assist me, please? When I was very young – and stilll in the Infants School, we were taken into a large hall which must have been the Junior Hall, to listen to a talk by Magnus Volk. He had long white hair and a longish grey beard as far as I can remember but very kind eyes – that was my impression anyway. He was such an impressive old man – in his 80s – and he told us many interesting things about his inventions and of course his railway. I remember when the rails went over the sea and at high tide you could look down into the water. It was an exciting ride in those days! Hi Magnus Moore, we have a note to my mother in law(which she received when she was small) which says love from ‘Uncle Volk’. It’s written on headed paper namely ‘Volk’s Railway’. Her maiden name was Moore. Is she from the same family as yours? I wondered if you can reply to diane@ruff16.f9.co.uk please. I’m Alexandra Volk, my father is Bernard Volk and my grandfather is Bernard Volk, so I guess my great great grandad is Magnus Volk. I am just starting to do a family tree. I don’t know much as my father is not in contact with me and has many other children from different marriages. Any help would be appreciated. Thank you.